Allergy Free Air Purifier, Vacuum Cleaner and Wet Vacuum ALL-IN-ONE! Designed to replace conventional vacuum cleaners, not to compete with them. Although 25% smaller than the AF1, the Thermax AF2 has the same powerful motor. The AF2 is recommended for environments that are primarily composed of hard floors. It is also excellent for cleaning area rugs and carpeting. Thermax has lead the way once again by redesigning and incorporating its revolutionary hot water extraction and water filtration technology into a lightweight, compact, easy to use home care system, the Thermax AF2. It will replace your traditional air purifier, vacuum cleaner, and steam cleaner, changing the way you clean forever! Because of your Thermax's patented design, you can now clean the air in your home just like nature. But rather than passing the water through the air with precipitation, we've even perfected nature, on a smaller scale of course, by passing all the air through the water. Because there are some components of house dust that are not water soluble such as microscopic particles of sheet rock and cement dust, your AF2 uses a unique double protection filtration system. 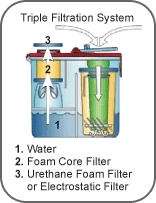 Between the water, which is responsible for trapping 97% of the contaminants that enter your AF2, and our special urethane filter which traps the remaining 3%, your AF is the only system in the world that has an up to 100% allergy free operation. By running your AF2 to water wash your air for an hour once or twice a week, the dust content in your home will be dramatically reduced, cutting your cleaning time in half. Your A/C filters will last 3 times as long! Water also has the natural property of absorbing odors, so once the stagnant and recirculated air is trapped in the water, you pour the condition down the drain or outside and it is gone forever! You can use your AF2 with plain water for a fresh natural scent or add two capfuls of either Thermax's Aqua Blue or Valley Fresh to both deodorize and sanitize your air. Both solutions therapeutically cleanse your indoor environment, neutralizing any harmful germs and bacteria, leaving your home healthy and clean. The average family spends hundreds of dollars each year on candles, aerosols, plug-ins, and potpourri to eliminate odors, but all they really do is cover up the problem by masking them. By adding 10 drops of your favorite fragrance to your AF2, you can add a nice scent to your air while it's being purified. Run your AF2 about 15 minutes in a room and the 100% allergy free fragrance will remain in your air up to 8 hours! By adding Eucalyptus to the water, you can use your new AF2 to replace your traditional vaporizer. Vaporizers can be very helpful if you have a cold or the flu because they add medication to the air so you can breathe freely and get the necessary rest you need. Simply add 10 drops of either Eucalyptus or Eucalyptus/Menthol fragrance and let your AF2 run only 15 minutes before going to bed. During that time you will water wash your air, deodorize and sanitize with your Aqua Blue, while adding the medication which will last your whole night's sleep! Throughout every operation of the AF2 Total Air Treatment, the air maintains a 50% humidity level, which is the ideal amount of humidity for breathing. Your Thermax AF2 Total Air Treatment System can dramatically improve the health, comfort, and well-being of you and your family's indoor environment, and that's only 1/3 of your AF2's major functions! The Thermax AF2 Home Environmental Cleaning System represents a departure from the conventional vacuuming systems of yesterday, today and the future. The AF2 wasn't designed to compete with vacuums cleaners. It was designed to replace them. Because of the generally poor condition of the indoor air quality made worse by poor carpet cleanliness, many people are feeling the adverse effects stimulated by this phenomenon we have come to know as Indoor Air Pollution. There are many who are hypersensitive to matter which can produce allergic reactions, such as eczema, asthma, hay fever, etc. This matter is allergen, which is either inhaled, consumed or comes in direct contact with the skin. The inhaled allergen is airborne and is the most common and difficult to avoid. Some of the most predominant allergens and their particle sizes are as illustrated below. How then do the vacuum and the vacuum cleaning process influence the indoor environment of an allergy sufferer? 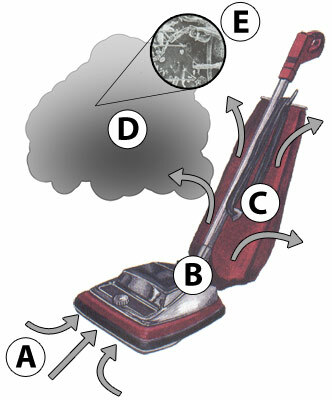 Many have suspected and recent worldwide testing has proven the conventional dry bag or bagless vacuum cleaner to be guilty of contributing greatly to poor indoor air quality by allowing fine particles of dust and allergens to pass through the pores of the conventional vacuum bag and back into the indoor environment. They can remain airborne for several hours before finally settling back down onto the furniture and floor. While airborne, these particles are breathed into the lungs of anyone present. This explains how vacuuming can reek havoc on an allergy sufferer and other who have respiratory problems. Current vacuum cleaner manufacturers are running rampant to try and address this new consumer awareness regarding the inefficiency of the filtration of conventional paper bag and bagless type vacuum cleaners. However, because of the basic outdated design of the conventional vacuum cleaner, anything done to improve their filtering capability will decrease the system's air flow. As air flow is decreased, you also proportionately decrease the vacuum's cleaning efficiency. It is estimated that a conventional dry bag or bagless vacuum loses over 50% of its cleaning efficiency when only 1/3 full! A. Dirt contaminated with germs and bacteria being extracted from carpet surface through the vacuum head. B. Dirt contaminated with germs and bacteria entering traditional dry bag or bagless vacuum cleaner. C. Contaminated air traveling through the pores of the bag or filter media exhausting small particles of dirt, dust, germs, and bacteria back into the atmosphere. Note: The particles too large to escape the dry filter lodge themselves into the pores on the inner lining of the filter media, causing reduction in air flow and cleaning ability. D. The minute particles of dirt, dust, germs, and bacteria escaping the dry filter where they can remain airborne for several hours. E. Cross section of dust and allergen particles magnified. These particles are inhaled by anyone present in the room, entering the lungs, reeking havoc to an allergy sufferer or those with respiratory problems. Thermax exclusive and world's first U.L. (Underwriter's Testing Laboratory) approved, 10' Electrified Vac Hose safe for both wet and dry pick-up. Whether you're cleaning the dust from your lampshade or picking up a spill in the kitchen, your electrified vac hose is safe for any application. Ideal for larger working areas and multi-level homes, Thermax offers optional 14 and 20 feet hoses that are available exclusively through this site or from your authorized distributor. Any of your AF2's Attachments or Optional Accessories can easily connect to the wand to extend up to an additional 3.5 feet for those hard to reach areas. With its polished, stainless steel finish, you'll never have to worry about it rusting or corroding. Additional extension wands are also available through this site or from your authorized distributor. Deep clean your upholstered and leather furniture, bed mattresses, throw pillows, vehicle interiors, and draperies, removing the deeply embedded skin scales, pet dander, dust, and dust mites. All of this condition is trapped into the one place it can never escape, the water, and is removed from your home forever. Tired of rearranging the dust in your home? Your dusting brush is safe on all fine wood and leather furnishings, electronics, blinds, base boards, ceiling fans, glass surfaces, A/C vents, vehicle interiors, and much more, and will change the way you dust forever. If you could color code each particle of dust in your home so it could be recognized, you would find that by using traditional dust rags and dusters it would take chasing the same piece of dust 40-50 times before you finally caught up to it. By trapping the dust into the AF2's patented water filtration system, you'll never clean the same piece of dust twice and you can finally remove all of the condition from your indoor environment. The 10 inch hard surface attachment replaces ever having to use conventional brooms, dust pans, and mops and is safe on all ceramic tile, hardwood, linoleum, stained concrete, brick, slate, and marble flooring. It can also be used on your walls, rafters, and ceilings. The broom is the oldest tool we use today and is decent at picking up the larger pieces of debris that are too heavy to float, but the smaller particles are stirred back up into the air to settle throughout your home on top of your refrigerator, countertops, and other furnishings. That's where the old saying “Sweeping up a Storm” comes from. Because we've all been taught to use dry tools--on dry surfaces--trying to remove dry dirt and dust, all we've been doing is rearranging the build up in our home. With the AF2 the hard surface attachment replaces your broom, and the water replaces your dustpan for unsurpassed, water washed cleanliness. Once the dirt, dust, food crumbs, pet dander, hair, and lint are trapped into the water, it's then poured outside and gone forever. Once you remove the dry dirt and dust from your home, the hard surface attachment also replaces your mop. Spray your favorite low sudsing cleaning solution onto the bare floor, agitate with your attachment, and extract from the surface. Your floor will dry in less than 5 minutes. Most importantly, every time you spray your solution, it's clean. No more rearranging filthy mop water on your hard floors. The AF2's motorized dry vacuum head is safe on all residential and commercial grade carpeting, area rugs, and hard floors. It self-adjusts itself to any height of flooring and lays 2.5 inches to the surface to clean under low furniture. The cork screw designed agitator brush is 12 inches in width, features 1/2 inch edge cleaning, and rotates at 6000 RPM creating a self-propelled feel revolutionizing the way you clean, making it almost effortless. As the lowest point in the indoor environment, carpet and area rugs are the main source of the build up that gets tracked in from outside. If you aren't able to remove the condition from your carpet and area rugs, you'll never remove it from the air inside your home. Through everyday activities we unknowingly walk through a lot of unsanitary things such as oil, grease, gasoline, pet feces, stale cigarette and cigar butts, spilled food and garbage, public restrooms, and probably worst of all we're constantly seeing people clearing their throat and spitting on the sidewalks! All these things get tracked in along with the dirt, and our carpeting acts like a big sponge and cleans the soles of our shoes, where it dries out and becomes brittle, and as you move about your home it breaks up into fine particles that begin floating in the air. Now instead of walking in them, which sounds bad enough, you are actually eating them with every breath you take! It took 100 years from the invention of the very first vacuum to finally engineer a true home environmental cleaning system. With the Thermax AF2 you now have a complete system to allow you and your family to live in a cleaner, healthier indoor environment.